Is mad science is your thing? 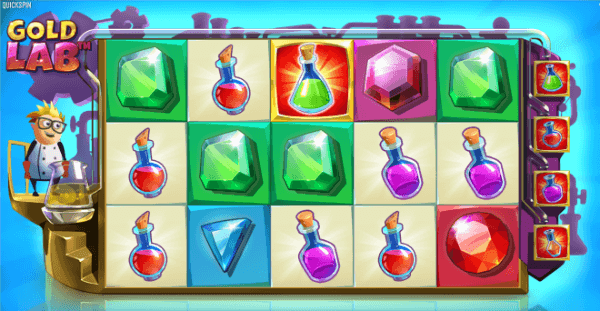 Mad scientists make great themes for video slots as they are quirky, exciting, and give developers the opportunity for incorporating a variety of unusual game features. They also provide interesting themes with unique symbols, graphics and sound effects. If you are interested in trying some great games with a theme you may not have experienced before you came to the right place. These four slots which can be found at many online casinos may be the ones you have been looking for! 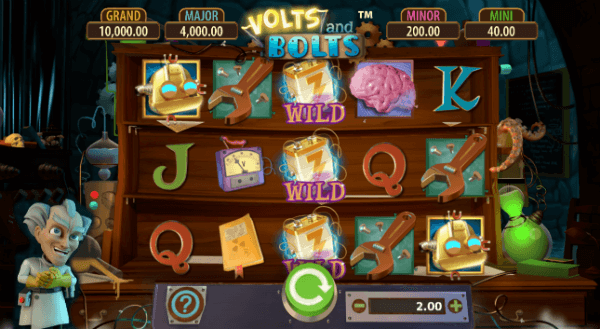 Volts and Bolts is the creation of developer Williams and is a 5 reel slot with 50 paylines. The game is set on Dr Volt’s laboratory and has the look and feel of your classic mad scientist’s lab complete with electricity gone wild. The prime aim of the game is to unlock the Robot Lock It feature by getting six or more robot symbols. This will give you the chance of striking the 750x your wager jackpot. The next best outcome is the Mad Scientist Free Spin. With this feature you can win up to 100x your wager with 12 free spins. With nice clear graphics and an entertaining soundtrack this is a good slot for mad scientist fans. Betsoft Gaming is the software developer that has bought out this solid slot contribution. The theme is based on the famous Dr Frankenstein and his monster written by Mary Shelley. 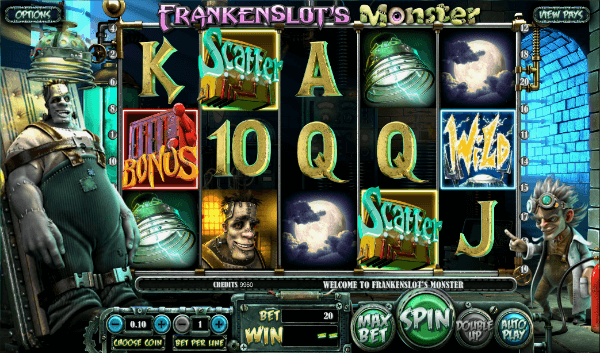 Frankenslot’s Monster is part of Betsoft’s slots3 gaming range and is a 5 reel, 3 row slot, with 25 paylines. The game is set in Frankenstein’s sinister underground laboratory as he works to animate his infamous monster. This is a classic slot with a wild symbol (a wild that looks electrified) and two bonus games. The first is the scatter this bonus which is activated when three scatter symbols are turned up which unlocks free spins. The second is the Monster Bonus and is triggered by turning up three bonus symbols on reels 1,3 and 5. This will take you to another screen where you adjust dials and pull the lever to give the monster life. This can award you with a bonus of up to 25x your wager! 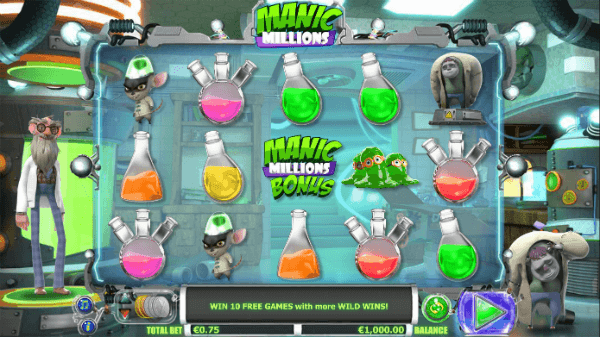 NextGen Gaming’s Manic Millions is a slot with 25 paylines over 5 reels and 3 rows. It has more of a carefree, cartoon like look and feel when compared to the previous two games. The slot offers some really nifty extra features. The wild symbol in this game is the mad scientist himself and can work in place of any other symbol except the Bonus icon which is the scatter. There are a number of bonus features in this game. The first are the free spins triggered by the scatter, the Igor bonus (the science assistant) which adds a wild, the Igor Scatter bonus which adds scatter symbols, and a gamble option where a win can be doubled by clicking the clubs/hearts icon and guessing the right suit. This is a fun and colorful slot game with plenty of juicy extras. Software developers Quickspin are the company that have bought out Gold Lab, a 5 reel, 3 row slot with 25 paylines. This slot is modeled on the ancient practice of alchemy – the desire for turning lead into gold. Despite its medieval background, this is a light-hearted, cartoonish slot that is fun and provides some nice winning opportunities. Free spins are activated when you land three Golden Bonus symbols (the scatter) on the first, third and fifth reel. That will give you four free spins, and any beakers that match the bonus beakers colour then become wild and you can win extra spins. This is a nice slot, with sound effects that are quiet and subdued. It may be good if you need to wind down rather than get amped up to play.